Like so many, I crafted and created all sorts of things long before I ever came to work with glass. Along the way, I was exposed to all kinds of techniques and materials, some of which I still enjoy and share with you here from time to time (e.g. 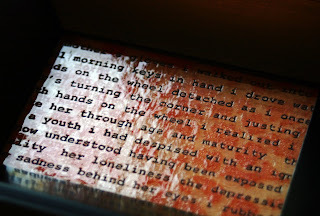 crochet, calligraphy, photography and bookbinding). These are not experiences one just checks at the studio door. 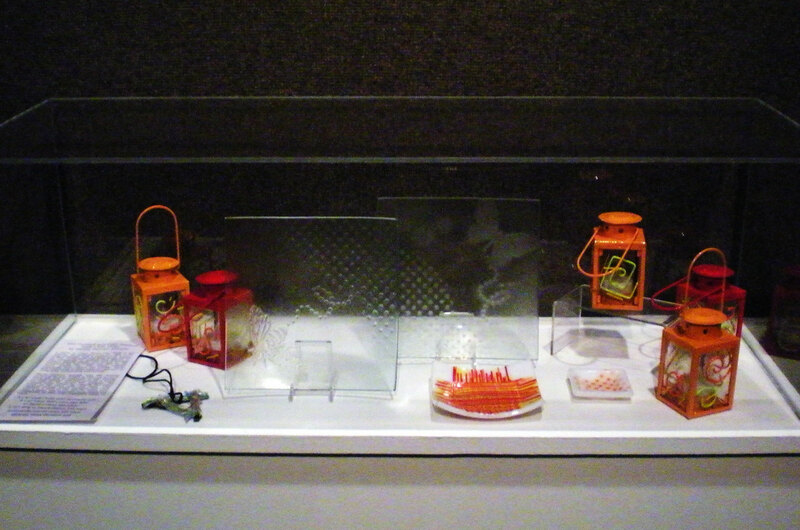 In fact, they often contribute to the design or direction a particular work in glass may take. 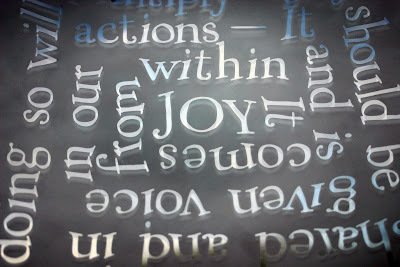 Of particular interested to me has been bringing my love of calligraphy to my work in glass. So I am very excited to be offering a one day workshop highlighting multiple ways to letter in glass. During this workshop we will work both on the surface of glass and in/with glass itself learning to etch, sandblast and carve lettering onto the surface as well as using various techniques to apply enamels and glass powders which will be kiln fired. This class will offer techniques fusers can include in their “toolbox” for design. But it is not just for fusers. Open to anyone interested in lettering, this is a great opportunity for calligraphers, scrapbookers, or writers to experiment with ways to capture words in glass. Lettering in Glass workshops are scheduled for Saturday, January 8, 2011 from 9:00am-5:00pm and Sunday, June 26, 2001 from 9:00am-5:00pm. For more information and to sign up contact Wired Designs Studio at 210-495-4495. With fall in full force and the solstice less then a week away, I have begun to break out my winter wardrobe. As I head off to work I find myself reaching for a scarf or hat to stave off the chill of the morning air. 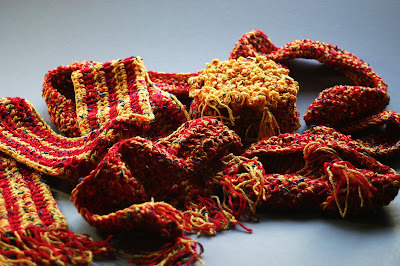 Each year when this happens I instinctively react by reaching for a crochet hook and a skein of yarn, as if I needed yet another ten foot scarf with tassels. This year is no different. So as I have an abundance of winter accessories, I decided to share this year's creations with others by posting a selection of my handmade crocheted scarves on Etsy. Each one is unique and a great addition to your winter attire. Pick one up for yourself or as a truly warm gift for someone you care about. You can see these and other crocheted scarves on my Etsy Store. 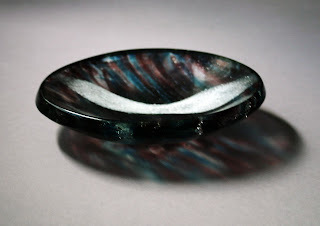 I am very excited to announce I have been invited to teach at the 2011 Glass Craft & Bead Expo in Las Vegas, Nevada. In 2011, Glass Craft & Bead Expo will be March 30th through April 3rd. The show room floor will be open April 1st through the 3rd. 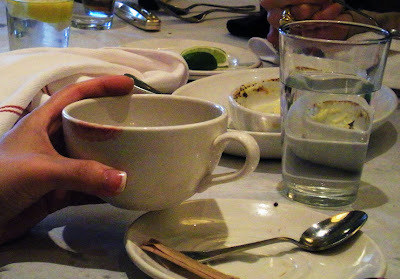 How a finished piece feels in your hands is as important as how it looks visually. Learn what goes into making glass feel smooth as satin, as well as how to create dynamic textures. 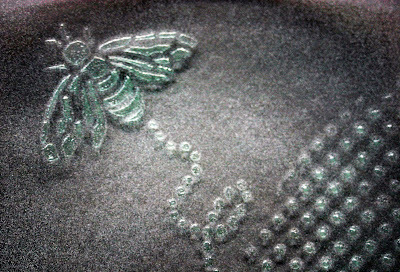 Students will learn a variety of fusing and cold working techniques to add additional interest and complexity to their finished work. They will work with Bullseye powder, frit, stringer and sheet glass to create surface application that enhances the overall work. We will discuss when and how to utilize primers, fiber paper/blanket and lava cloth to achieve specific results. Make a piece people will pick up and never want to put down. There is all kinds of good information for any fuser who is ready to take their work to the next level. Drop your chisel and learn how to achieve a sculpted look in your glass with the assistance of your kiln. We will design and create bas relief images and textures using fiber paper to form impressions in glass. This is a wonderful technique to add dimension and pattern with economy of both labor and materials. 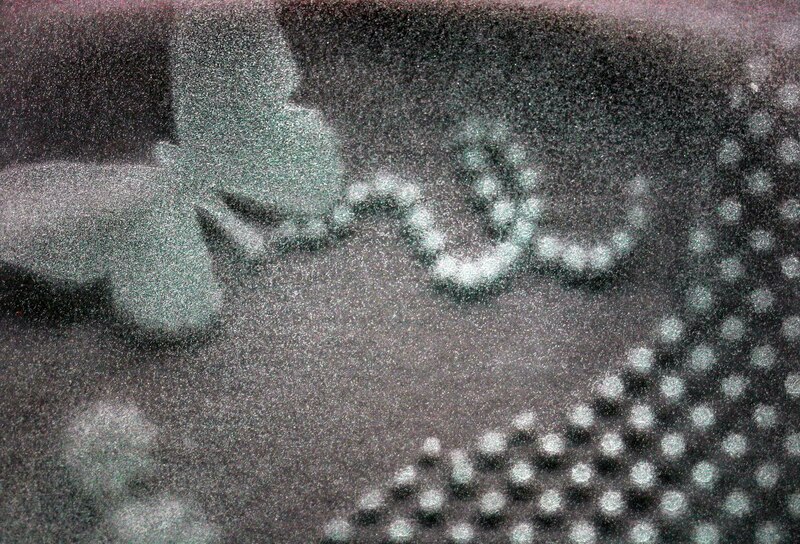 Use the smooth clean surface on top and look through to the pattern within the glass. Or turn it over and not only see but feel the shapes and textures. 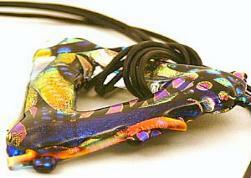 You can sign up for this and other workshops online at the Glass Craft & Bead Expo website. I recently completed an on again off again reading of The Glass Bathyscaphe, How Glass Changed The World by Alan Macfarlane and Gerry Martin . The book delives into the history of glass looking at the impacts this material had on science, art, education and society. The excerpt below is taken from the chapter on glass and the Renaissance. I enjoyed this chapter in particular and thought I would share a bit of it with you here. "Prespective and realist portraits are natural and normal, but usually the cultural conventions of a society teach artists and others that the representations their audience want are not of this kind. Artists are, as it were, systematically taught to distort the world they see and would normally portray, in order to make it fit a symbolic system which conveys deeper meaning then the prosaic world of sight. What is the point of art if it mearly duplicates what the eye sees?" Nina "Sam" Hibler from Dream﻿ Fire Glass and I will have glass jewelry, functional and art items for sale at this one day event in Seguin, Texas. This is a great opportunity to enjoy the charming town of Seguin and do some holiday shopping. Handcrafted items make unique one of a kind gifts that stand apart from department store finds. 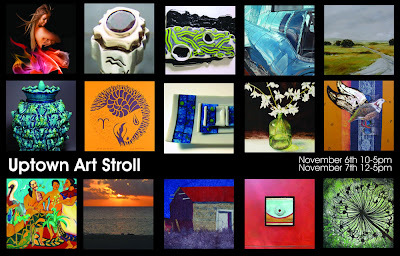 If you make it out please stop by, say hello and take a look at the wonderful glass items on display. Hope to see you there! Artisans at Rocky Hill proudly presents ‘Tis the Season for Jewels” A Trunk Show, showcasing six Hill Country jewelry artists. This delightful Holiday event will introduce visitors, not only to the latest creations by these talented ladies but, also provide the opportunity to meet the artists, enjoy the development of their work plus purchase never before seen pieces. The Holiday Season is the perfect time of year for giving locally created, one-of-a-kind jewelry pieces to your special someone. 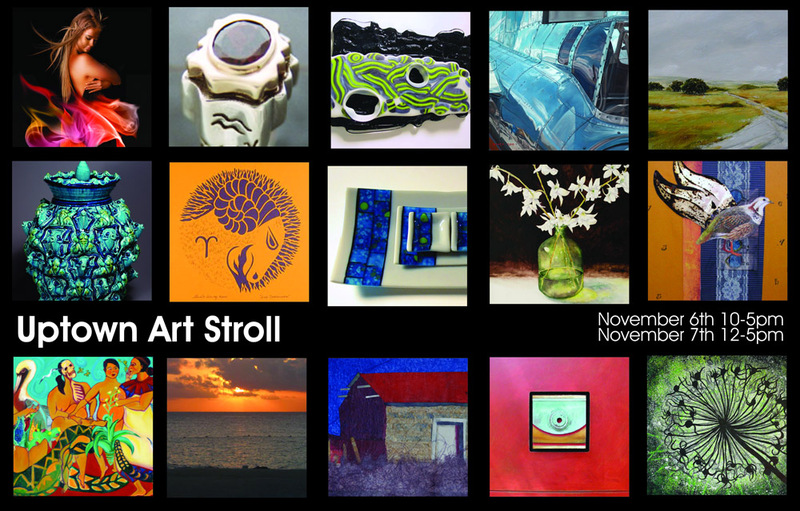 The show is from 12:00 pm until 8:00 pm during First Friday Art Walk Fredericksburg. Jewelry artists unveiling their never-before-seen pieces and demonstrating their unique gift are Debra Carlise of Austin, Anna Elrod of Austin, Nicole Lozano of San Antonio, Dottie Moon of Hye, and Michele Thomas of Boerne. Enjoy the season, along with the many galleries located in the historic district of downtown Fredericksburg, during First Friday Art Walk Fredericksburg. Wines by Torre di Pietra will be served along with cheeses by the Amish Market. I am excited to be participating the 2010 San Antonio Potters Guild annual Clay Ole event. This event is free and open to the public. Hand crafted work from local and regional potters, glass and fiber artists will be on display and available for purchase from 10am to 5pm at the San Antonio Jewish Community Center's Holzman Auditorium located at 12500 N.W. Military Highway in San Antonio, Texas. Look forward to seeing you there. You'll find me and several other members of the San Antonio Glass Art Guild (SAGAG) at the home of SAGAG member Louise Craig. Stop by to enjoy the glass blowing demonstrations by Larry West. 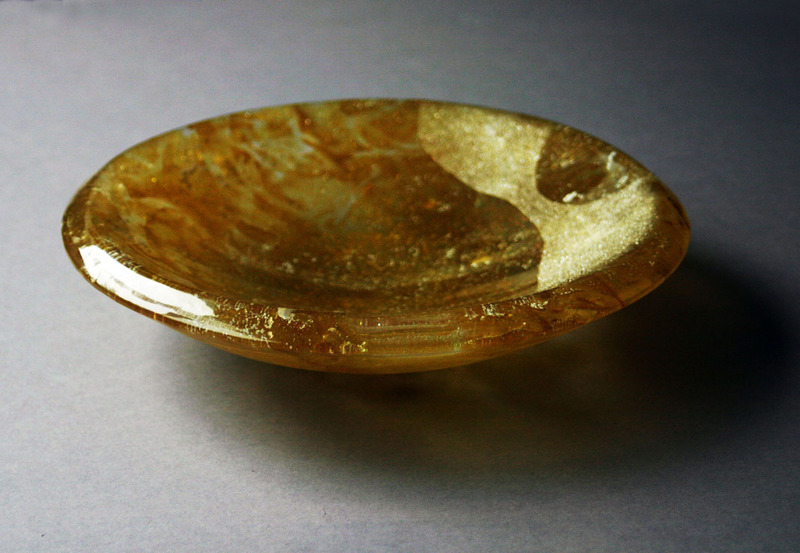 The work of a variety of fine glass craftsman will be on display and available for purchase. See map for location of this and other Art Stroll participants. Join us for Janice Peacock's presentation on Full Circle: A Glass Beadmaker's Jouney. Janice has a diverse background in theater and ancient culture. Hearing about her full circle journey through the created life should be quite interesting. See you there! Thank you to everyone who stopped by ART281 last Saturday. Next you will find me at the St. Thomas Episcopal Church Fall Festival on Saturday, October 23 from 10am to 7pm. This looks to be a fun filled day for family and friends to enjoy actives, food and music, in addition to arts and crafts. I'm looking forward to the excitement. Hope to see you and your family. The San Antonio Glass Art Guild (SAGAG) is sponsoring ART281 an one day venue for artists and art organizations to display, promote and sell their art work directly to the public. The event takes place today on the grounds of My Place Bar & Grille from 10:00am to 6:00pm. I will be their along with around 40 other artists. More information, including a list of participating artists, is available at http://www.art281.com/. Stop by and enjoy the festival atmosphere with dancers, musicians and artists. The San Antonio Glass Art Guild's (SAGAG) recent excursion to view the Mathews collection of art glass at the Mcnay Museum had me pulling books off my shelves to refresh and expand my knowledge of Art Nouveau and Art Deco glass work. The exhibit is heavy with French glass including a few pieces from Rene Lalique but many Emile Galle and the Daum brothers. It's a lovely collection if you have the opportunity to see it. Here are the books I pulled off my shelf for a little "homework". Art Nouveau by Gabriele Fahr-Becker breaks down it's information by location allowing you to see the impact of particular parts of Europe and America on the Art Nouveau movement. It provides the reader with resources like a basic glossary, high level artist bios and a complete reference list. This book was a educational resource which provided information on various art and craft influences including glass. For the purpose of my review I narrowed in on the chapters on Paris and Nancy France. I reviewed America & European Glass, from the Dayton Institute a catalogue of work from the Dayton Institutes Eilleen Dicke Gallery of Glass which includes both Art Nouveau and Art Deco work. And I read Introduction to Art Nouveau Style by William Hardy , which includes chapters on specific craft media including glass. Although brief this chapter provides a high level overview of the who/how glass was used from the 1870s through the early 20th century. Published in the United Kingdom in 1986 this book is not as readily available as others. I'm not entirely sure how or when I came to own a copy of it myself. If you know of any others I should read on the subject please let me know. I am excited to be organizing a special docent tour of the Jeanne and Irving Mathews Collection of Art Glass at the McNay Museum, on hehalf of the San Antonio Glass Art Guild (SAGAG). The Jeanne and Irving Mathews Collection of Art Glass, was assembled by Mrs. Mathews with her husband, Irving, who passed away in 1993. Focused on the Art Nouveau and Art Deco periods in France, the exhibit includes work from Daum Frères and Emile Gallé to René Lalique, as well as rare works by Gabriel Argy-Rousseau, François Decorchement, and Jacques Gruber. This first showing of art glass from the Mathews Collection appears in specially designed cases, ideal for small sculpture and decorative arts, on the Garden Level of the Stieren Center for Exhibitions. To particiate, you will need to bring $5 per person. This includes your museum admission. Upon completion of the docent tour of the glass exhibit, you will have access to view other exhibits at your leasure. Since Shakespeare wrote of Ophelia and her demise an abundance of artists, writers, actors and musicians have applied their perspective to her story and used her image symbolically. To which I add my own, currently on display as part of the Kerrville Art & Cultural Center as part of their invitational glass show Luminous. 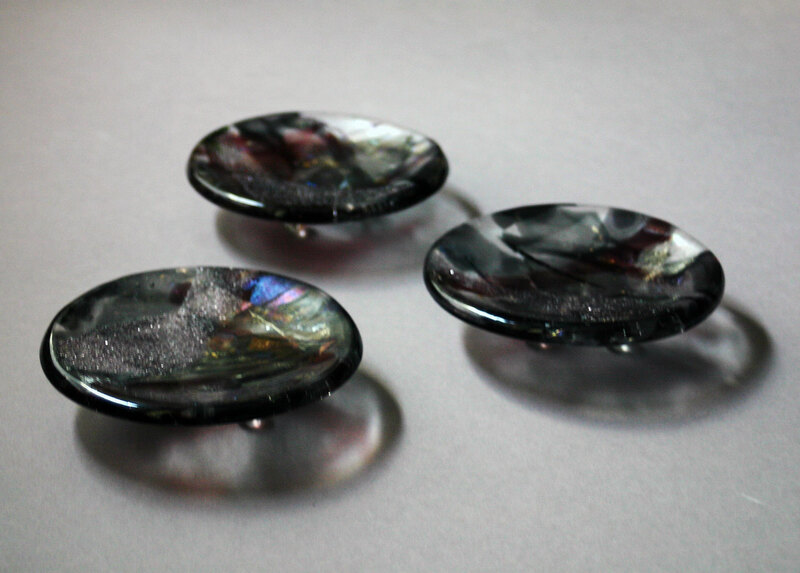 Several years ago, I shared with you the Ophelia series of glass beads created by Nina “Sam” Hibler. They were inspired, I believe, in part by the Pre-Raphaelite painting of Ophelia created by John Everett Millais. For the last 12 years an Ophelia like print of The Young Martyr by Paul Delaroche has hung in my home. Although I was not consciously considering it when I made this piece, it obviously had an effect. Other influences included Arthur Rimbaud’s poem on the subject. In the far-off woods you can hear them sound the mort. Has passed, a white phantom, down the long black river. Has murmured its ballad to the evening breeze. The rushes lean over her wide, dreaming brow. A mysterious anthem falls from the golden stars. O pale Ophelia! beautiful as snow! Yes child, you died, carried off by a river! That spoke to you in low voices of better freedom. Who one April morning sate mute at your knees! Heaven! Love! Freedom! What a dream, oh poor crazed Girl! And fearful Infinity terrified your blue eye! White Ophelia floating, like a great lily. Today I lead a Fusing I workshop at Wired Designs Studio. During these classes, I like to direct students to resources they can go to review the material we discussed. 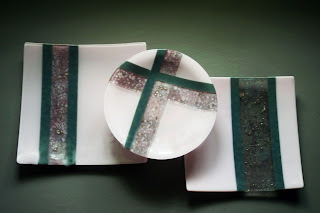 Consistently the resources I have recommend include Contemporary Warm Glass by Brad Walkers and Richard La Londe's Fused Glass Art and Technique . This Year Brad Walker put out a updated version of his book as Contemporary Fused Glass . It includes much of the same content as the original but with updated technical information and examples of contemporary glass artwork. This is a great resource for anyone interesting in pursuing kiln formed glass. My advice to students, read it through so you are familiar with what it contains. Then keep it handy so you can refer back to it with you have questions or are preparing for a project. 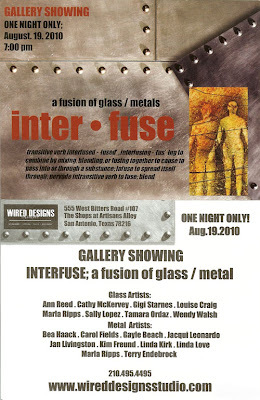 Please join Gail Stouffer, Liza Connell and the rest of the Wired Designs team as we celebrate the successful completion of yet another intermediate seminar. This one night show will highlight the work of eight glass and ten metals students whose work demonstrates the increased technical depth they have achieved during this intensive nine week course. When working at Wired Designs Studio I often get asked, "why Wired Designs... where did that come from". Well, here's a hint. and the spirit shall return unto God who gave it. I love to read. At times I latch on to a subject or an author and read until all is consumed or the hunger is satisfied whichever comes first. As a young girl I devoured Jane Austin and Jack London at different times for different reasons. Down the road a bit, I found myself reading the work of Henry James . I return to one novel, The Golden Bowl , every few years. The story focuses on two couples, but it is the women Charlotte and Maggie who stand out to me. Childhood friends who grow to be such different women in character and temperament, they become an interesting study of femininity. When working on my version of the golden bowl, an object that crosses between these two women and revels all, I took into consideration not only the object in the story but the character of those who come in contact with it. The bowl in the story is fragile. It cracks not only furthering the plot but somewhat symbolic of the situation the characters find themselves in. My Golden Bowl is not delicate at all. Rather it is substantial and strong, like the characters themselves. The female silhouette with the cinched waist of corseted Victorian woman, shines on the surface. I wonder, whose path will my Golden Bowl cross. What stories might it become a part of? At present you can cross the path of this piece by stopping in the Artisans of Rocky Hill gallery in Fredricksburg, Texas. The following pieces will be on display as part of Luminous the Kerr Arts and Cultural Center Invitational Glass Arts Show. The Show runs from July 29 through August 29, 2010 with a reception on August 21 from 1-3 in the afternoon. Tuesday through Saturday 10 a.m. - 4 p.m.
and Sunday 1 - 4 p.m.
Take a closer look at two of the pieces in this month's exhibit at the SAVA Gallery. 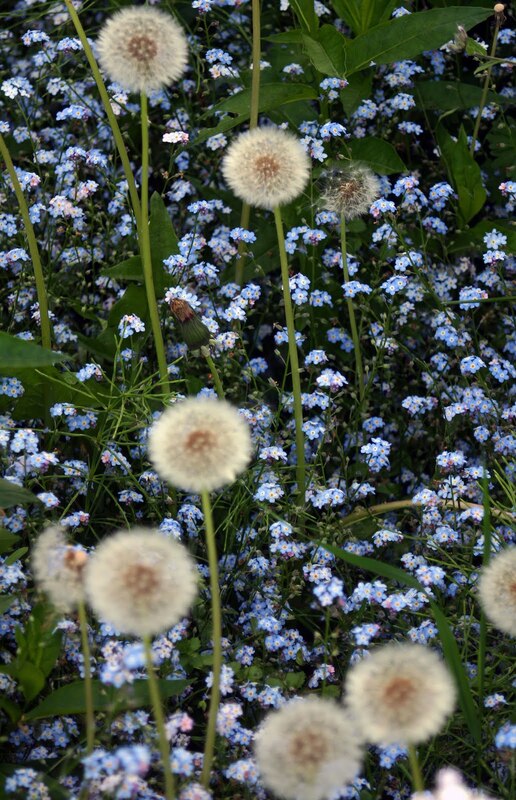 For more information on planting a butterfly and bee friendly garden check out this article by Ben Groves over at Suite101.com . The SAVA Gallery will be presenting work from local visual artists with summer in mind. "Let's Go Parking" is the theme of this month's show. The exhibit will be on display for the month of July. A nice cool refreshing break if you're walking the streets of downtown San Antonio this summer. Completely exhausted I climbed into bed early one evening. Grabbed the book sitting on my bedside table. The one that had been sitting there for months, maybe even a good year, unread. 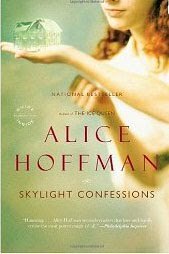 It was Alice Hoffman's Skylight Confessions . Like most of Hoffman's stories you get to know the charters through the course of the quickly developing plot. Before I knew it I was sucked in and didn't move until I had read the book, cover to cover. At the center of the story, almost a charater itself, is a house called the Glass Slipper. Built of glass the home requires care and expresses pain just as the people in the story do. One can almost imagine looking into this house and seeing rooms of pain, hope, love and disspare. Among them the skylight window where a young man escapes. The book was a diversion. During those hours, nothing else existed but the story and the peace I gleaned from this brief escape from relativity. My apologies. 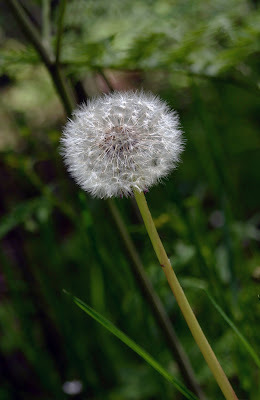 After years of relatively regular entries, I simply dropped off the face of the blog-o-sphere for a full two months without warning. I have no excuses. Simple put I got burnt out. Not with blogging but with the overwhelming craziness that became my "to do list". It got to the point where I had so much I needed to do that I wasn't very effective at anything. So in response, I did nothing.Well, not much anyway. But it's time for my personal strike come to an end. I'll start by catching you up. Not now. Not all at once. I'll resume my creative online journey bit by bit over the next few entries till I'm back on course. Thank you for your patience. Don't go to far there will be more to come quite soon. I promise. I had a conversation with someone recently about the weeds, dandelions to be precise, in their lawn which they are trying so desperately to rid themselves of. 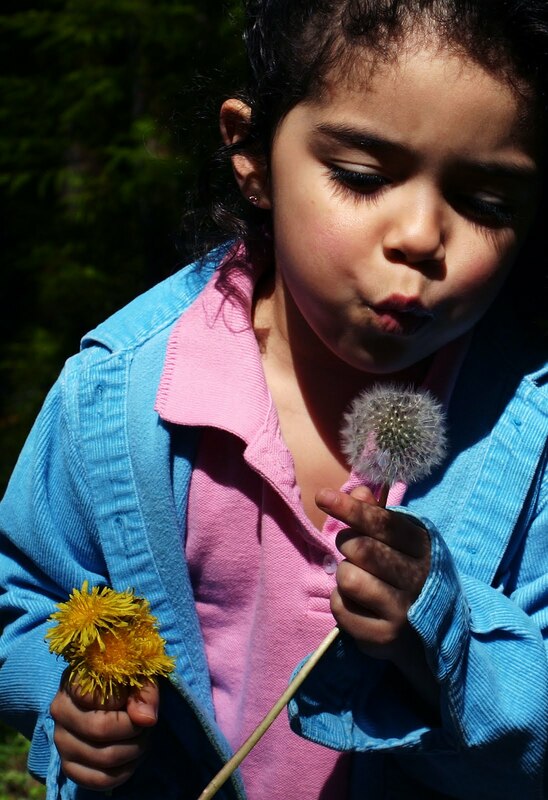 It reminded me of these photos and how excited my niece had been each time she encounter a dandelion on one of our walks in the woods. A nuisance to some, an absolute delight to others all depending our one's perspective. There's a lesson to be learned here I'm sure.